Four-term lawmaker Chung Sye-kyun was elected chairman of the main opposition United Democratic Party (UDP) at the party's national convention in Seoul Sunday. Chung, 58, won 5,495 or 57.6 percent of 9,540 votes cast, followed by Rep. Choo Mi-ae, 50, with 2,528 votes or 26.5 percent and Chyung Dai-chul, 64, with 1,517 votes or 15.9 percent. Chung replaces Sohn Hak-kyu, whose term ended last Friday. He will lead the party, which has 81 seats in the 299-member National Assembly, for the next two years. Five members of the party's decision-making Supreme Council were also picked. They are two-term legislator Kim Jin-pyo, 61; three-term lawmaker Song Young-gil, 45; Ahn Hee-jung, 43, a close confidant of former President Roh Moo-hyun; former lawmaker Kim Min-seok, 44; and two-term legislator Park Joo-sun, 59. In his acceptance speech, Chung pledged to make the utmost efforts to reinvigorate the economy, saying that the Lee Myung-bak government is causing a crisis for the people and the country. ``I propose a round-table meeting to resolve bread-and-butter issues in which ordinary citizens as well as politicians and government officials can participate,'' he said. The turnout stood at 78.2 percent of 12,194 delegates nationwide. 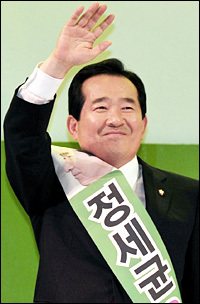 Even though Choo and Chyung decided to join hands in the runoff, they failed to beat Chung who was commerce minister during the Roh Moo-hyun administration. The two politicians agreed that whoever received the fewest votes, he or she will declare his or her support for the other in the runoff. UDP regulations state that a runoff must take place if no candidate garners 50 percent or more of the votes cast. The new UDP leader served as chairman for the now-defunct ruling Uri Party, the de facto predecessor of the UDP, twice in 2005 and 2007. He is said to have a manager-like leadership as he showed stable performances during his tenure. During the convention, delegates approved a bill to change the party's name to the Democratic Party. Delegates also decided to have only one chairman lead the party to promote internal unity. The UDP was led by Sohn and Park Sang-cheon. The Supreme Council was also promoted to become the decision-making organ of the party.